We have a brand new image from Dark Phoenix that introduces a potentially exciting element to the X-Men franchise for longtime fans. This is going to be the final movie in this version of the franchise, which has been going since the first live-action X-Men movie was released in 2000. But the series will be sent off in grand fashion and we've learned that Genosha, a very important location for mutantkind from the comics, is finally making its way to the screen. This information comes from director Simon Kinberg directly. Kinberg has served as a longtime writer and producer of the franchise and makes his feature directorial debut here. 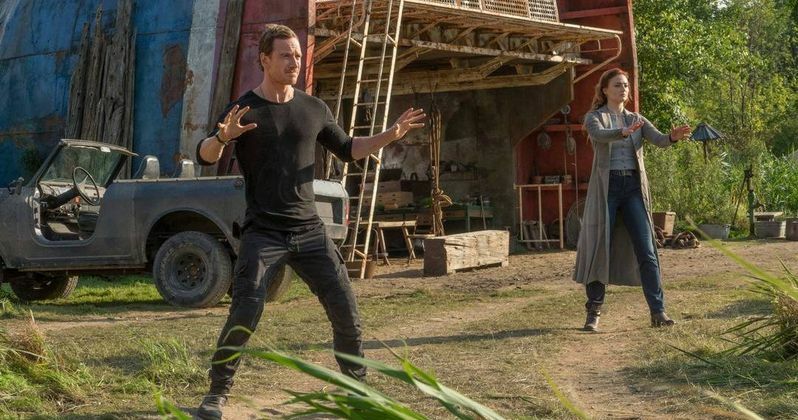 An image has been released online that showcases Jean Grey (Sophie Turner) exercising her powers alongside Magneto (Michael Fassbender) on Genosha. Kinberg had this to say about the location and how it factors into the movie. "Genosha is something that I've always been fascinated by. It's sort of Oz for mutants. As a Jew, its parallels to Israel and the notion of the promised land intrigued me even as a kid. I was looking in previous X-Men movies for a way to incorporate it. It was something I thought about for Apocalypse, but then went in a very different direction." For those who may not be familiar, Genosha is a fictional island nation from the pages of Marvel Comics that first appeared in Uncanny X-Men #232 back in 1988. It's something of a safe-haven for mutants and, in Dark Phoenix, Magneto has built up the island using scraps of metal from the sea. Jean Grey, after getting her unwieldy new Phoenix powers after a mission gone wrong in space, heads there to seek out the help of the longtime enemy of the X-Men. Disney completed its merger with Fox recently, which means that the X-Men and Fantastic Four franchises will ultimately be in control of Marvel Studios, also owned by Disney. That means they're going to bring this version of the continuity to a close, something that was recently confirmed at CinemaCon. So this movie is going to serve as a swan song of sorts, which means there is a pressure to deliver the goods. That said, we've heard quite a few rumors that things were a bit messy behind the scenes. Significant reshoots were ordered. Though, that's quite common for major blockbusters these days. In many cases, those reshoots actually end up saving movies, like World War Z. So who knows? Maybe this will be a fitting send-off for this version of the mutants. We can only hope so, as Marvel Studio President Kevin Feige has confirmed it will be a long time before we see these characters show up in the MCU. As it stands, early box office tracking has the movie looking at a possible franchise-low debut. Dark Phoenix is set to arrive in theaters on June 7. Be sure to check out the new image from Empire below.